Let me start off this post by saying I’m not a purist. My food philosophy is to eat well 80 – 90% of the time and the other 10 – 20% not beat myself up about what goes in my mouth. This applies to holidays. On Thanksgiving day and Christmas day I eat what I want, (within reason). What fun is it if you’re going to a family holiday event or a Christmas party and you can’t enjoy the food that’s on offer? Same goes when my family and I go on vacation. I’m not about to spend money on a beautiful resort and nitpick over the sugar content is of a particular dessert. So long as when I get back home and after holiday day it’s back to healthy eating as usual, I’m okay with it. I should say however, my family and I have no health concerns to speak of. If we did, it may be another story. However, during the holiday season many people gain weight, (there are even studies looking into this phenomenon). Not only does this make you feel crappy when your jeans no longer fit, but it’s also not necessarily a healthy thing. Visceral fat – that fat around your belly – is the most dangerous kind of fat. These fat cells release inflammatory cytokines that increase inflammation throughout the body. This can lead to various health conditions and metabolic dysfunction. In fact, fat cells act like an endocrine organ in regards to how they secrete cytokines, (inflammatory molecules). They’re also able to produce estrogen in the body via a process called aromatization. This can lead to an unhealthy condition known as estrogen dominance. So, as much as I’m all for being happy with your body at any size, I think it’s important to remember that being overweight is not usually a healthy thing and it can lead to inflammatory conditions, metabolic dysfunction, and an excess of estrogen in the body. So how can we do our best to avoid holiday weight-gain and stay healthy during this time of indulgence? Here are my top tips. Drink half your body weight in pounds in ounces of water every day. This very simple act of remembering to drink water can stave off dehydration, which can masquerade as hunger drawing us closer to the baked goods and candy. Not only that, over 90% of our blood is made up of water. Needless to say, water is a very important part of overall good health. This is one fundamental pillar of optimal health that shouldn’t be overlooked during the holidays. Set an alarm on your phone or download an app, which will remind you to drink your water periodically throughout the day. I own a 10 ounce glass drinking bottle, which I keep next to me all day every day and make sure it’s always filled up. Once you get into the habit of drinking water it’s really quite easy to continue. And don’t forget to filter your water. I think this is the first thing you should invest in when it comes to your health: a good water filter. My favourite is the Berkey. Make sure you eat fibre, fat and protein at every single meal. This is to help stabilize your blood sugar, and it might be the very thing that saves you from the dessert buffet at the next holiday party you attend. Fibre, fat and protein help to slow down blood sugar spikes that would otherwise happen if you ate a carb-heavy meal. Having stabilized blood sugar is so important for so many different reasons, which you can read about here. But during the holidays make an extra special effort to stabilize your blood sugar so you have more ability to say no to the tempting treats because you’re not feeling hangry and desperate for some carbs and sugar. 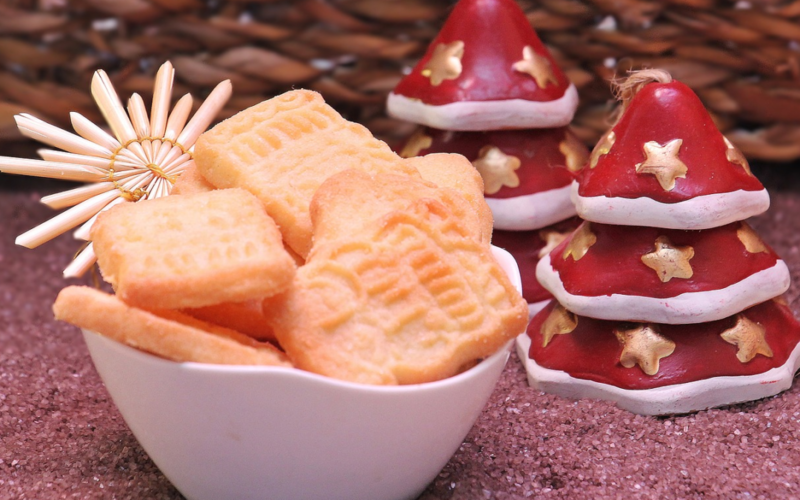 Make your own healthier treats to take to holiday parties. Don’t allow yourself to get stuck at a Christmas party where the Christmas cake, trifle, and chocolatey sugar-ladened desserts are calling your name. Instead, bring your own healthier desserts. There are so many delicious options for desserts that unsuspecting party guests will never guess aren’t bad for you. I have a bunch you can choose from in my Healthy Desserts E-Book, which you can download here. Weigh yourself daily. Yep, I said you should weigh yourself daily. This is especially true if you have an issue with your weight to start with because weight gain during the holidays has been shown to be a bigger risk to those who are overweight or formerly overweight. It’s important to see how you are tracking so you can keep yourself in check as your weight can easily slip away from you when the champagne is flowing and the desserts are a daily occurrence,(please note, if you have a prior history of an eating disorder then please do not weigh yourself daily). Don’t stop exercising! My favourite forms of exercise are yoga and running but when the mercury drops here in Canada it’s hard to keep up my running routine (not to mention when the ice starts to cover the sidewalks! Don’t even talk to me about that – I’m an Aussie who’ll never get used to icy sidewalks). So what I’m planning on doing is going to Bikram yoga instead of doing my runs and sticking to my kundalini yoga practice at home that I do online through Gaia or YogaGlo. I think one of the keys during these holiday months is to not give up your exercise routine. Exercising will keep you feeling good mentally and physically and give you more energy. Plus, it will go a long way to helping you avoid gaining weight. Meditate. The holidays can be a stressful time for some so I suggest now more than ever to keep up with a meditation practice. I try to meditate once a day (I’m not perfect – I don’t always accomplish this but it’s definitely a priority of mine). My top tip is to choose a set time and place you can commit to every day. For me, it’s usually when I sit down at my desk before I start my work. I highly suggest doing your meditation first thing in the morning as it really helps to set your day up on the right path from the get go. I simply sit in my big, comfy office chair and put my headphones on and listen to my daily Headspace meditation. Another one of my favourite guided meditations is this yoga nidra. But how can meditation help you not gain weight during the holidays? The answer is; stress reduction. When we’re stressed we released the hormone cortisol. Cortisol’s main role in the body is to increase blood sugar. This increase in blood sugar also increases our insulin levels and all this blood sugar and insulin imbalance can lead to insulin resistance. Insulin resistance will see you pack on the weight because insulin is our fat storage hormone. Reducing your stress will go a long way in reducing stubborn weight, especially belly fat. Monitor your alcohol consumption and try these tricks instead. Alcohol is nothing but empty calories and carbs. Drinking is certainly a big part of many people’s holiday festivities. I get it. But if you want to watch your waist and maintain your health let me remind you that the safe limit for women is only 3 servings of alcohol per week! If you have a holiday party coming up on the weekend then watch your consumption of alcohol during the week so you can have a glass or two at the party. Be sure to pace yourself and drink a glass of water between every alcoholic beverage you have. Another option is to take along some fizzy water and enjoy this with some mint, lemon juice, or even frozen berries such as raspberries or blueberries. This is the perfect way to still have a drink in your hand that is delicious and satisfying, but that doesn’t leave you feeling like crap or disturbing your valuable microbiome or hormone balance. Don’t give up your morning lemon water routine. Just like your exercise and meditation routines, be sure to stick to your morning lemon water routine. Adhering to these simple routines will really amp up your health game and keep you motivated and inspired to stay on track. I know that when I’ve let my morning lemon water routine slip it sets a bad tone for the rest of my day. What’s more, lemon water in the morning will support your liver (a key player in our detoxification), which is important when we’re over-indulging a little during the holidays, and it will help to keep your bowels regular and stimulate digestive function, which can be impacted by poor food choices and alcohol consumption. Don’t know what a morning lemon water routine is? It’s simple! Just squeeze half a lemon into some room temperature water and add a bit of pith or peel too. Drink it first thing once you wake up and then wait 10 – 15 minutes before you consume anything else to let the lemon water do it’s thing. Don’t show up to a holiday party hungry! This is important because you don’t want to catch yourself starving and subsequently vacuuming up all the entrees in site and devouring the cheese balls as if you’ve not eaten in days. And never mind the dessert buffet… Nope, don’t be that person. Instead, eat a healthy, filling meal full of healthy protein, fat, and fibre before you go to a party. Or, if you can’t eat before you go then bring a healthy snack with you such as jerky, grass-fed beef sticks, nuts, boiled eggs, raw nuts, veggie sticks, and almond butter. I get you probably won’t want to whip these out at the party, but have a sneaky bite in the car or heck – find a corner to have a nibble then rejoin the festivities. Fill up on veggies. When at a party make sure to first and foremost fill up on veggies. Head to the veggie tray and consume as many as you can! (Just watch the dips as these can be made with unhealthy ingredients). And during dinner load your plate sky-high with the vegetable dishes. I hope you find these tips helpful. The holidays don’t have to be a time when you end up feeling bloated, bigger and generally less healthy, but it does take a little bit of forethought and mindfulness to stay on track during this time of treats and temptation.